In most countries, central bankers seem to be taking on a sage-like role as their deft moves have supposedly staved off an economic recession, or rather, depression. With such an aura, it's thought that they could do no wrong and recessions will be a relic of the past. On the other hand, there are others, most notably Senator Ron Paul, who have been pushing for the abolishment of central banking. If only those in this camp had highlighted the stupidity of central bankers in failing to grasp the mechanics of money supply, then their call would probably have held sway. Instead they themselves are equally lost in their understanding of money supply, always harping on the beauty of the antiquated gold standard. The gold standard is irrelevant now as it was then. If these central bank abolishment advocates had studied the first Kondratieff wave, that is, the period in which the US had no central bank, then they would have understood why a central bank was (or wasn't) needed. A detailed account of this wave's depression which unfolded in the 1830s has been written by Alasdair Roberts in his book titled America's First Great Depression. Before we delve into how the US banking system worked without a central bank, let's check out the objectives of the US Federal Reserve as established by the US Congress in order to see whether they are achievable. If they aren't, we need to come with the true objective of a central bank to ensure its continued relevance. The Fed has only three objectives, to wit maximum employment, stable prices and moderate long-term interest rates. On the surface, they seem logical but if we analyse in detail, they are in all likelihood unattainable. In real life, we do come across circumstances in which the objectives of whatever we set out to achieve can't be fulfilled because we have no control over the factors that influence the outcome. If we are naive, we will stupidly accept blame for our failure to accomplish the goals. An entrepreneur, on the other hand, is resourceful enough to modify the objectives because his ultimate measure is economic gain. Not so for the Federal Reserve chairman; he's always under the illusion that all powers are in his hands. So it's his prime responsibility to realise the objectives come what may. Now, let's examine in turn each objective of the Fed to assess its feasibility. First is maximum employment. It is ludicrous for someone tasked with controlling the monetary policy to have any control over the unemployment level. Employment depends on many factors but monetary policy plays only a very minor role, if at all. In the modern world, technology can play havoc with employment. Whether you live in rural or urban areas, you can be priced out even if you're willing to work. Most of the unemployed are not necessarily lazy, it's just that their competitors are machines who can outwork and outsmart them. Where machines can't do the job, work will go to the cheap workers in third world countries. This phenomenon is nothing new: in Ancient Rome and Greece, the populace was laid idle by slaves and grain producing centres in North Africa and the northern shore of the Black Sea. Now you know why globalisation, or regionalisation in the ancient days, is to be dreaded. Next is stable prices. Central bankers have been deluded by their ability to stymie inflation in the 1980s, though if we look carefully, it wasn't central bankers but increased oil spare capacity causing oil prices to plummet that did the trick. Central bankers were wrongly given credit for which oil was more deserving. Since central bankers still believe this fallacy, they continue to fight consumer or retail price inflation (RPI) when that inflation is truly dead. But asset price inflation lives on and is easily triggered by a sudden surge in credit. As a result of monitoring the wrong inflation, the central bankers were caught flat footed by the escalating prices of real estate, stocks and commodities. 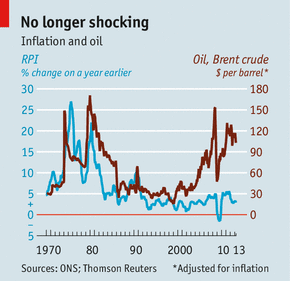 The Economist chart above shows how the two types of inflation have diverged since the start of the new millennium. In fact, this phenomenon applies to almost all countries. The central bankers took their eyes off the money supply (read, credit growth) and the excess money fuelled booms in commodities, stocks and real property. As for retail goods and services, excess capacity has suppressed their prices during the second half of the current Kondratieff wave. So stable retail prices are not the central bankers' doing, they're the consequence of excess capacity brought on by technological progress and globalisation. Add falling population growth to this combustible mix, you'll have a recipe for falling prices. No matter what the central bankers do, including pumping trillions of dollars of QE, prices will continue to drop. That leaves us with only one objective left, that is, moderate long-term interest rates. Many believe that Bernanke through his QE has the power to dictate interest rates. It appears that he can but in truth, his power to do so is limited, if not non-existent. Some prominent economists, the most popular being Gary Shilling, believe that Bernanke can suppress interest rates for as long as he likes. I used to agree with this view but after having a look at the Fed's balance sheet below and the way interest rates behave, I now have second thoughts. To understand why it's being accepted that the Fed has been instrumental in suppresing interest rates and inflating home prices, you have to look at the Fed's balance sheets at left. The reality is the Fed's debt holding is only $3 trillion out of total debt size of $57 trillion. What the Fed has been doing through its QE is swapping debt, buying higher interest Treasury bills and Fannie Mae's and Freddies Mac's mortgage backed securities (MBS) in return for zero interest notes or low interest deposits. The deposits are a recent innovation, created out of thin air in 2008. Swapping debts shouldn't have affected the interest rates on the rest of the debts. Check out any college economics texts on whether there's any change in the price of goods when there's no change in the quantity of demand and supply. I doubt so. Even we can go to extremes, assuming that the Fed buys the whole $57 trillion of debt. If there's no new debt created by Obama, immediately the interest rates would go up as money turns scarce. The holders of the $57 trillion deposits with the Fed (in return for giving up their T-bills and MBS) would not part with their deposits. They would hold fast to it as unlike T-bills and MBS, the deposits would not lose value when interest rates go up. Therefore, it's an illusion that the Fed dampens interest rates through QE. If you trace the real reasons behind the ultra low interest rates and the recent escalation in home prices, you'll discover that the US government and the private investment firms are the main contributors. Interest rate is the price of money and it's the law of economics that price goes up when demand outpaces supply. As money is essentially credit, only Obama can create money through his massive deficits. Yet when the deficits were more than a trillion dollars annually over the last 4 years, the economy still remained in a slump. This combination of plentiful money and anaemic demand has depressed the price of money. This largely explains for the low interest rates. Bernanke's QE happened to coincide with Obama's deficits sowing confusion as to the real cause of the low interest rates. If Obama hadn't continued with his annual trillion dollar stimulus, Bernanke wouldn't have dared to buy the T-bills. It's because the interest rates would've kept on rising ensuring the continuing drop in the market value of Bernanke's T-bills. The Fed would've been left with staggering losses on its T-bills holding making it technically insolvent. The Fed's charade is being exposed with the sequestration coming into effect on 1 March 2013. As this year's US deficit is being slashed, money availability is getting scarcer. 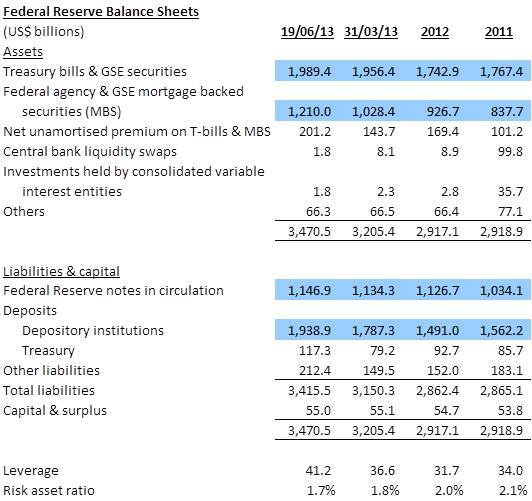 Look at the Fed's balance sheets above and you can see that the Fed dare not put any new money in T-bills in the 2nd quarter of 2013. As it is, it's bound to suffer large losses with its existing T-bills holding. As per its latest balance sheet, its carrying cost of T-bills and MBS is $200 billion above their par value (shown as Net Unamortised Premium in the balance sheet). Assuming that the Fed will maintain them to maturity, the potential losses that the Fed may suffer is $200 billion, easily wiping out its capital base of $55 billion. Not to worry, the interest rates will one day drop again. That will occur when all prices start falling, be they consumer goods or investment assets. However, it's the nominal interest rates that will fall. The real rates will remain high as a result of falling prices. The fall in nominal rates will only rescue the T-bills from a sharp drop in market value but it won't protect the Fed's MBS because the MBS are secured on homes, the value of which will definitely crash in line with other assets. Like its T-bills holding, the Fed's increasing MBS holding doesn't in any way increase the prices of homes nor lower the interest rates. If you look at the Fed's balance sheets above, it has lately increased its MBS more aggresively than its T-bills, adding $200 billion in the last 3 months alone. 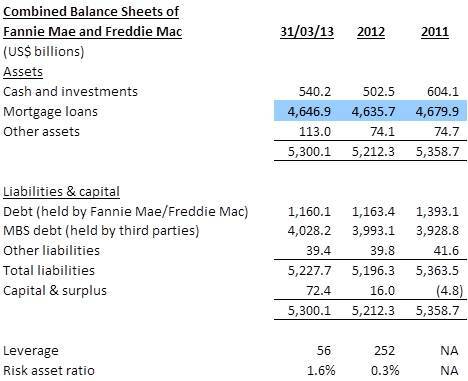 To see whether this is new MBS or MBS already existing in the market, we have to look at the combined balance sheets at left of Fannie Mae and Freddie Mac. The figures highlighted in blue above are the mortgage loans of other banks that have been securitised to the two home financing GSEs. Note that since 2011, the amount has hardly budged. So it means that the Fed's MBS addition represents existing MBS of the two GSEs that were held by other investors. Those investors were more than happy to give the MBS to the Fed in return for more secure deposits placed with the Fed. Who's the greater fool in this transaction? Obviously it's the Fed because it's taking on unnecessary risks in home financing. We can see why the Fed is acting so. Since the prices of homes are rising at a blistering pace (see the Case Shiller trio of charts below), the Fed has less to lose compared to investing in T-bills. Note that of the trio below, the % monthly change, that is, the rightmost chart, affords the most predictable pattern. But why have home prices continued to be on an uptrend in the face of declining money supply? Actually, what's unfolding is money is being siphoned from other asset classes, such as emerging markets, commodities and bonds, to home investment. The New York Times chart at left shows that private investment money is flowing into home purchases at an increasing rate. My earlier post also has charts depicting the decline in property purchases by individual owners and home ownership rate. The money flowing out of emerging markets also explains why Brazil, Turkey, and pretty soon, other BRICS, the East Asians and the Asean countries are erupting. The protestors are equally confused. Their discontent covers a wide spectrum – corruption, limited democracy and power abuse – but nowhere will you find in the list, disappearing money which is actually the root of the problem. Every government has its peculiar imperfections; an economic depression magnifies them by many orders of magnitude. Changing government therefore won't be the solution to their grievances. The bigger question is, can the Fed keep on buying T-bills and MBS? Again, the Fed balance sheet can shed some light. 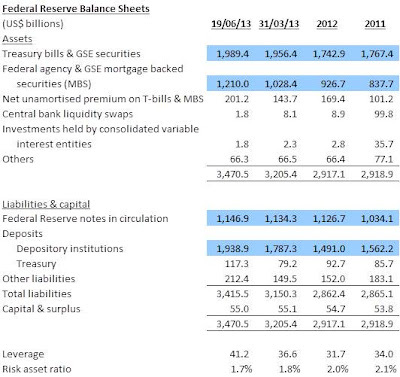 As of 19 June 2013, its T-bills and MBS stood at $2.0 trillion and $1.2 trillion. Compare this with the Fed's puny capital base of $55 billion, this represents a risk asset ratio of less than 2%. If you view from the liabilities angle, the leverage is 41 times after excluding notes in circulation whereas back in 2007 it was only 2 times. This is worse than that of Lehman or Bear Stearns before their collapse. Those failed banks were not supervised and so is the Fed. Bernanke is taking a big risk since it means that it just needs a drop of 2% in the T-bills and MBS value to wipe out the Fed's capital. Likewise, the two home financing GSEs share equally dreadful metrics with the Fed. They are all hanging tenuously on a thread. It may be argued that since they are all federal agencies, their financial standing is as good as that of the US government. Moreover, the US government has no limits on the amount of money that it can print. This is one common misperception about the financial strength of the US government. The financial standing of the US government does not depend on how much money it can print but, in the late stages of a Kondratieff wave, on how much deficit it is allowed to bear. The main reason why the US dare not intervene in Syria is that it lacks the financial means to carry out the hundreds of sorties needed to neutralise the Syrian air defence system. As it is, its air force aerobatic team has to decline participation in local air shows because of budget constraint. Even Wikileaks has the guts to humble the US government. What more the Chinese and the Russians who are now emboldened to thumb their noses at the US. You are seeing the early signs of the breakdown of the nation-state edifice.